The article A Gold-standard for truly sustainable enterprises, written by Chad Park and Bob Willard, was originally published on GreenBiz.com. A crisp definition and shortlist of essential characteristics of a truly sustainable enterprise — a Gold-standard against which we could compare companies’ progress — is long overdue. This benchmark clearly would describe what the destination looks like for companies on their sustainability journey. For example, Interface’s legendary “Mission Zero” vision enables them to explain their performance relative to a desired future state of real sustainability. We are in the midst of a collaborative project to test this notion by analyzing the rating and assessment system that underpins the B Corp movement through the lens of the system conditions for sustainability. 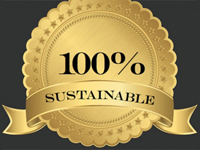 We anticipate that this will give us a sense of what it would take to create a Gold-standard for sustainable business. We held dialogue sessions on this topic at the Green Living Show in Toronto this month and more are planned at the Accelerate conference in Guelph, Ontario, in June. These sessions and others like them will provide stakeholder input to our collaborative work. We’ll also draw on it to provide input to the Global Initiative for Sustainability Ratings (GISR), and other like-minded initiatives. We invite you to join us in these ongoing consultations.